Be it summer or any other season, you need to stay hydrated. Water can help flush out toxins, boost metabolism, aid weight loss, improve digestion, keep your skin healthy, and what not! Wouldn’t it be amazing if you could enrich water with nutrients and make it visually more alluring? Because, hey, how many of us really remember to drink water? 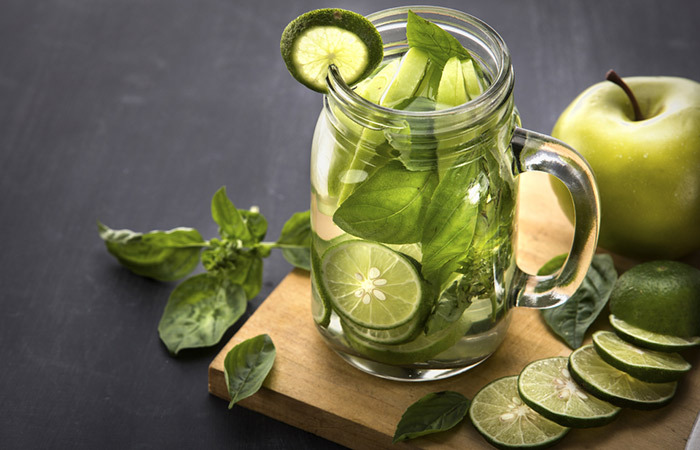 These colorful and delicious water recipes, enriched with the goodness of fruits, spices, and herbs, will get your attention and be immensely beneficial for you. 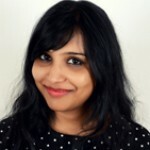 So, get ready with your chopping board and knife. Let’s make some magic! You can roughly chop the mint leaves or just toss them into a jar filled with one liter of water. Wait for 7 minutes for the water to taste minty fresh. Mint leaves have a cooling effect. They aid proper digestion and have anti-tumor, antioxidant, and antimicrobial properties (1). Steep the cinnamon in a 1-liter jar of water overnight. Thinly slice the apple quarter and add to the jar in the morning. Let it steep for 20 minutes for the apple to release its flavor into the water. Apples are rich in phytonutrients that help to lower bad cholesterol levels and fight cancer, cardiovascular disease, and asthma (2). Cinnamon aids weight loss, has antioxidant, anti-inflammatory, and antimicrobial properties. It also lowers cholesterol and reduces the risk of cardiovascular diseases (3). Crush the ginger root using a mortar and pestle. Cut the orange into medium slices with the peel on. 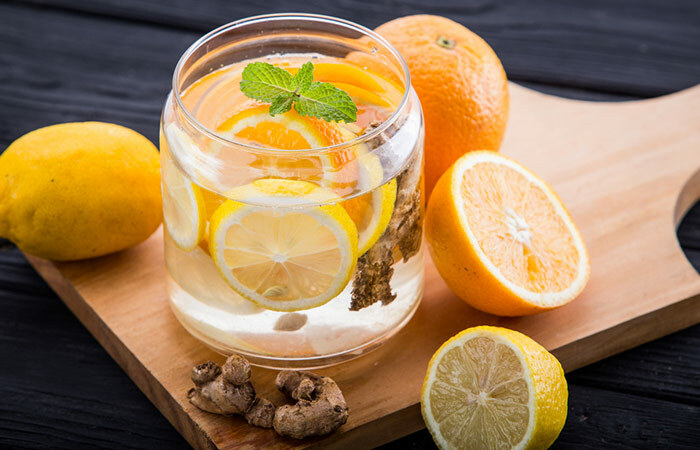 Add the crushed ginger and orange slices to a 1-liter jar of water. Let it steep in the refrigerator for 2 hours. Oranges are rich in antioxidants and vitamin C that prevent DNA damage and protect the heart (4). Ginger helps to reduce inflammation and muscle pain, prevents cardiovascular diseases and diabetes, and promotes gastrointestinal health (5). Slice the black grapes in half and the lime into medium slices. 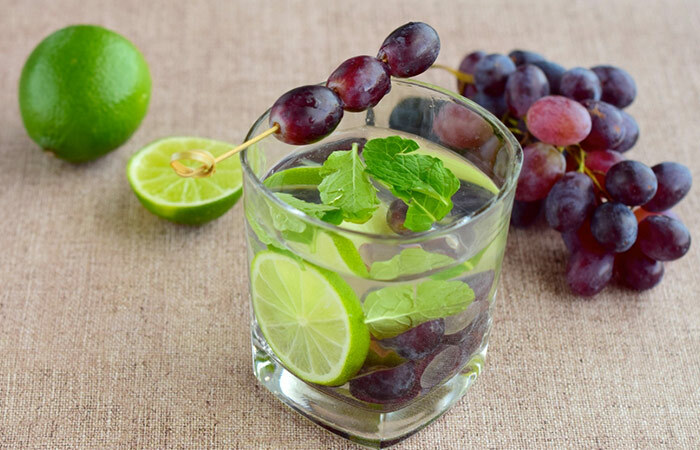 Add the sliced black grapes and lime to a jar or bottle filled with one liter of water. Let it steep for 20 minutes. Enjoy your drink! Black grapes inhibit cancer cell proliferation, lower cholesterol, and suppress platelet aggregation (6). Limes are a great source of vitamin C. They help relieve arthritis, stimulate digestion, prevent hair fall, and fight cold and cough (7). 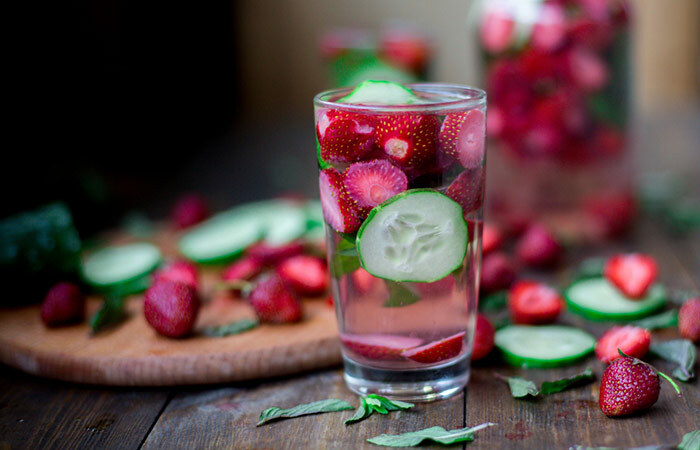 Toss the strawberry and cucumber slices into a 1-liter bottle or jar of water. Let it steep for 5-7 minutes and then drink it. Strawberries help to reduce inflammation, prevent diabetes and insulin resistance, and may help to fight various types of cancer (8). Cucumbers are low in calories and high in water content, and can help lower cholesterol, reduce skin rashes, and flush out toxins (9). Add the rosemary sprig to a jar or bottle filled with one liter of water and let it steep overnight in the refrigerator. You can make circular slices or thin wedges of the grapefruit. Add the grapefruit slices to the bottle in the morning. Wait for 10 minutes and then drink it up. 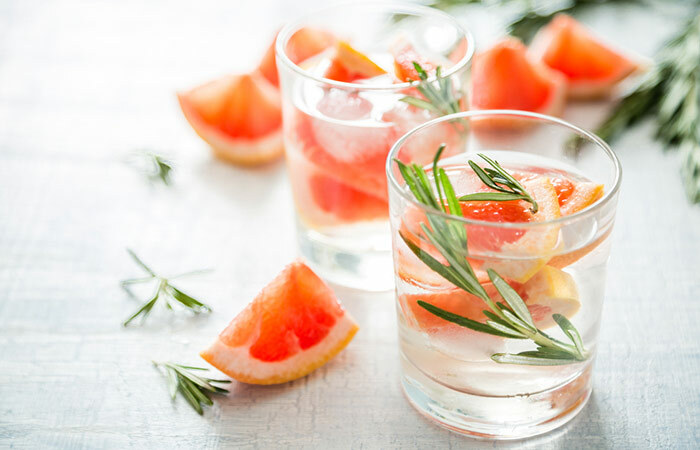 Grapefruit helps to reduce weight and increase insulin sensitivity (10). Rosemary helps to prevent neurodegeneration and brain inflammation (11). 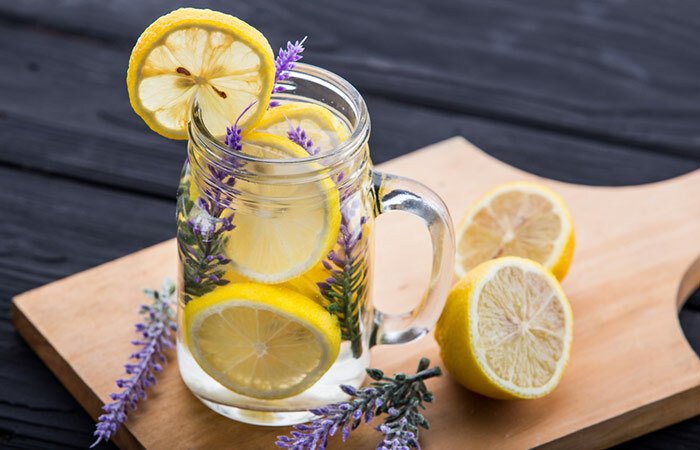 Add the lemon slices and lavender to a 1-liter jar or bottle of water. Let it steep in the refrigerator for an hour. Your refreshing drink is ready! Lemons are rich in vitamin C that helps to flush out toxins, boosts immunity, and aids weight loss (12). Lavender helps to reduce stress, treat parasitic infections, and relieve spasms (13). 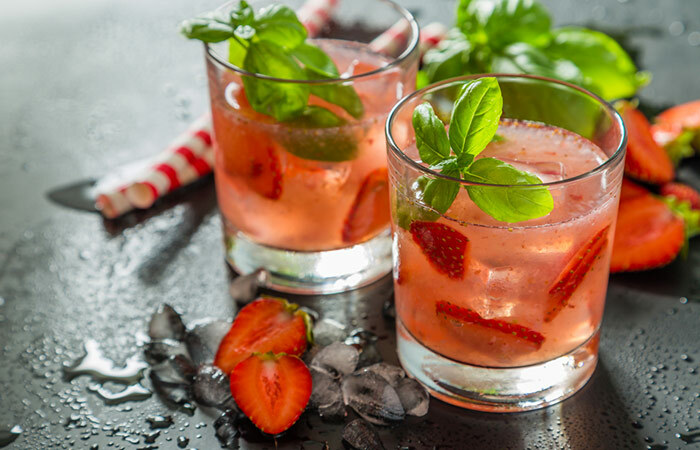 Toss the strawberry slices and chopped basil leaves into a 1-liter jar or bottle of water. Strawberries help reduce oxidative stress and inflammation, protect from obesity-related diseases, and fight various types of cancer (14). Basil leaves are loaded with antioxidants and help to flush out toxins and inhibit cancer cell proliferation (15). Toss the crushed ginger root and cranberries into a jar filled with a liter of water. Let it steep for four hours in the refrigerator. Drink. Cranberries prevent bacterial infections in the urinary tract, stomach, and mouth cavity. They can also prevent cardiovascular diseases and fight cancer (16). Ginger helps to reduce inflammation and muscle pain, prevents cardiovascular diseases and diabetes, and promotes gastrointestinal health (17). Add a teaspoon of cumin seeds to a liter of water and let it steep overnight. Add the gooseberry slices in the morning. Allow it to steep for 10 minutes and then drink it. 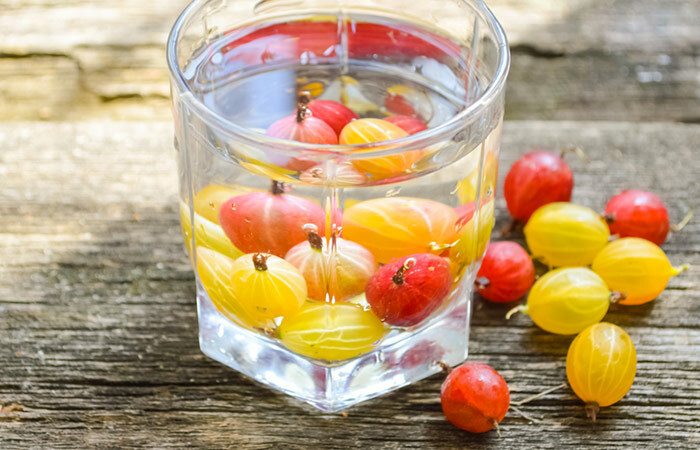 Gooseberries are helpful in treating digestive disorders. They also reduce inflammation and have liver protective, antioxidant, kidney protective, and neuroprotective properties (18). Cumin seeds support digestion, protect from cold and cough, and stimulate the menstrual cycle (19). 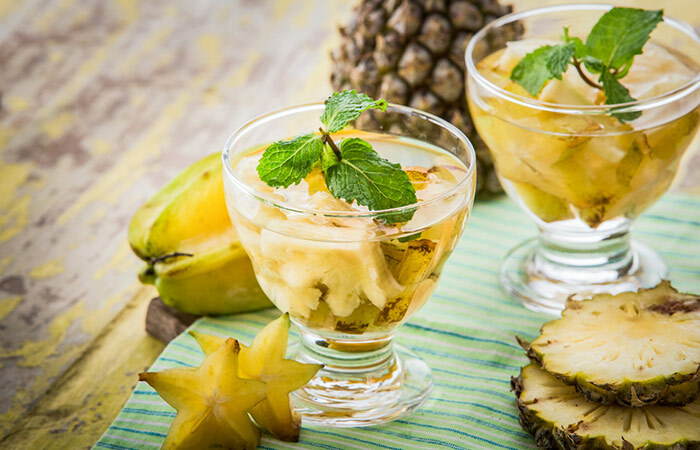 Add the star fruit and pineapple slices to a jar containing a liter of water. Star fruits are an excellent source of antioxidants and can also improve the lipoprotein levels (20). Bromelain is an active compound found in pineapples. It helps to treat angina, diarrhea, arthritis, sinusitis, and surgical trauma (21). 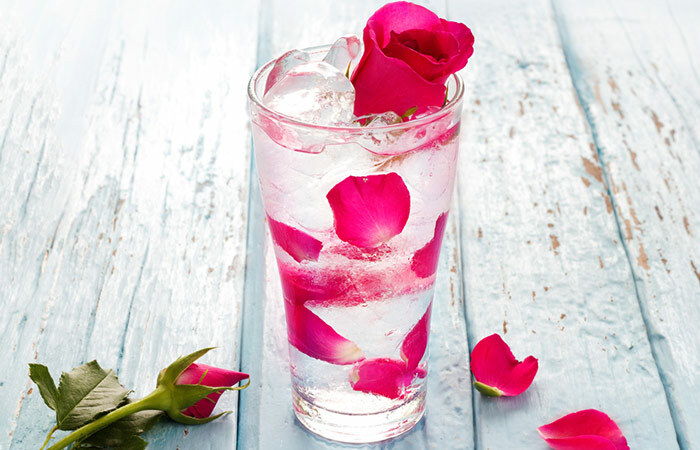 Toss the rose petals and fennel seeds in a 1-liter jar of water. Let it steep for four hours in the refrigerator. Rose petals help relieve stress, uplift your mood, treat digestive problems, and improve bowel movement (22). Fennel seeds help improve digestion, prevent DNA mutation, and have anti-inflammatory, cardioprotective, hepatoprotective, and anticancer properties (23). 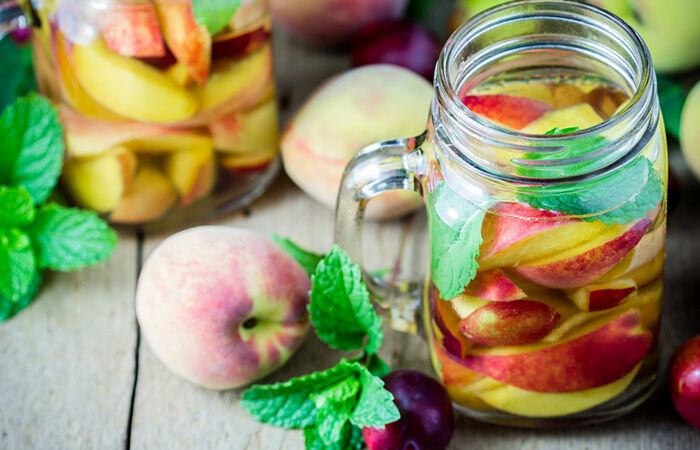 Toss the peach and mint leaves into a jar containing one liter of water. Peaches are rich in vitamin C, folic acid, vitamin B, lycopene, beta-carotene, and flavonoids that promote cell regeneration and help to rejuvenate your body (24). 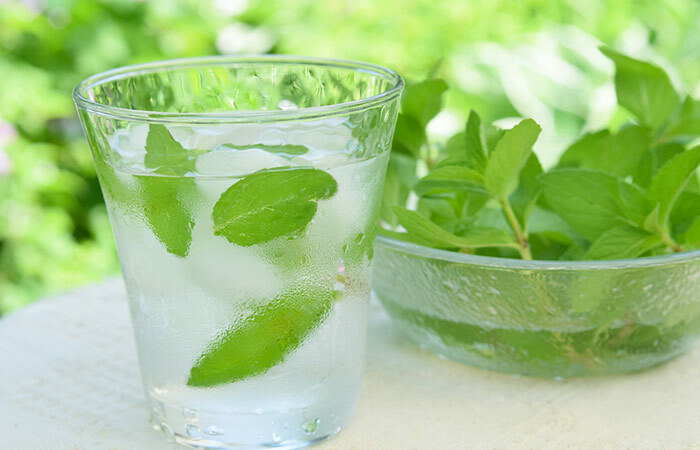 Mint leaves have a cooling effect. They aid digestion and have anti-tumor, antioxidant, and antimicrobial properties (25). Take the seeds out of the cherries and cut them in half. Cut the lime into medium slices. 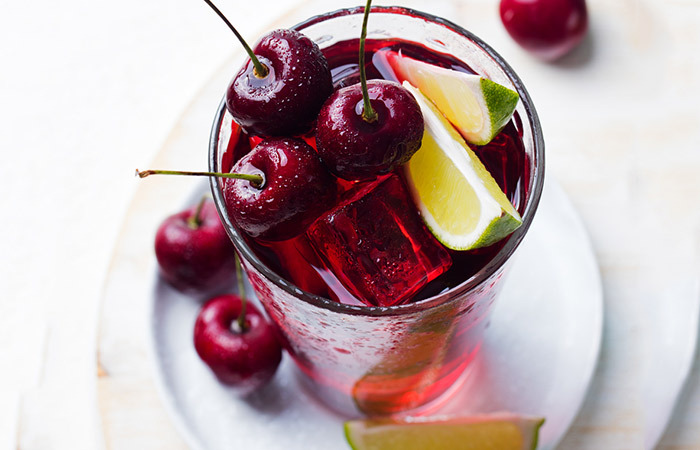 Toss the lime slices and halved cherries into a jar containing one liter of water. Let it steep for 15-20 minutes. Cherries help to protect against inflammation, diabetes, Alzheimer’s disease, cardiovascular disease, and cancer (26). Limes are a great source of vitamin C and can relieve arthritis, stimulate digestion, prevent hair fall, and fight cold and cough (27). Add the kiwi slices to a jar containing two cups of coconut water. Let it steep in the refrigerator for 10 minutes. Kiwis help to decrease platelet aggregation and triglyceride levels and increase good cholesterol (HDL cholesterol) levels (28). Coconut water is loaded with natural electrolytes and is the best natural drink for rehydration (29). Cut the orange into medium slices and the raspberries in half. 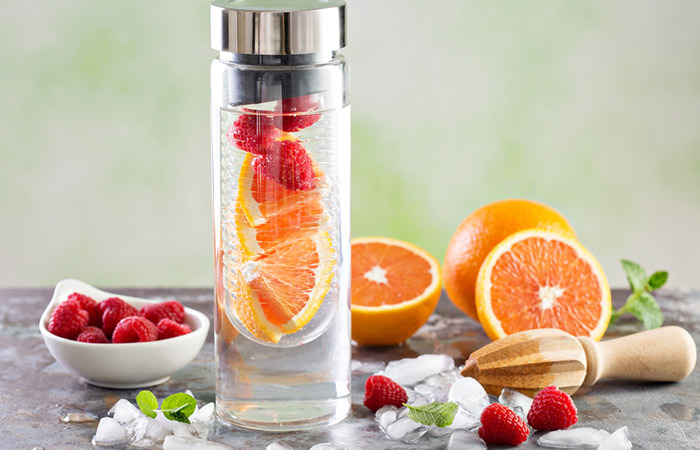 Toss the sliced oranges and halved raspberries into a jar containing one liter of water. Raspberries are rich in antioxidants that help scavenge the harmful oxygen radicals and fight cancer by inhibiting cancer cell proliferation (30). Oranges are rich in antioxidants and vitamin C that prevent DNA damage and protect the heart (31). 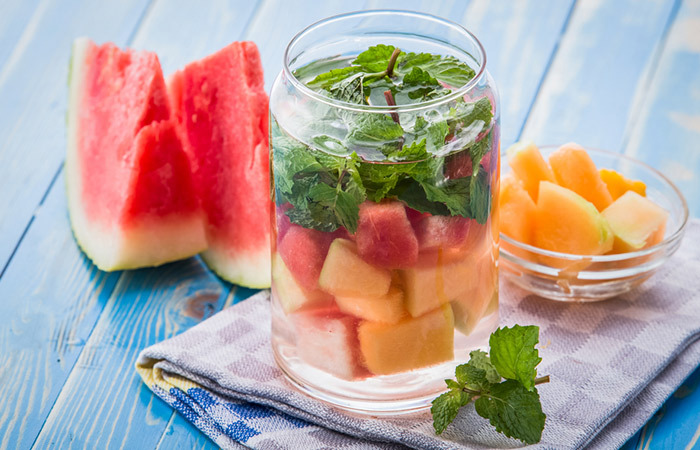 Toss the watermelon and honeydew melon cubes into a jar containing one liter of water. Let it steep for 20 minutes in the refrigerator. Watermelons can help protect against diabetes, cardiovascular disease, and macular diseases (32). 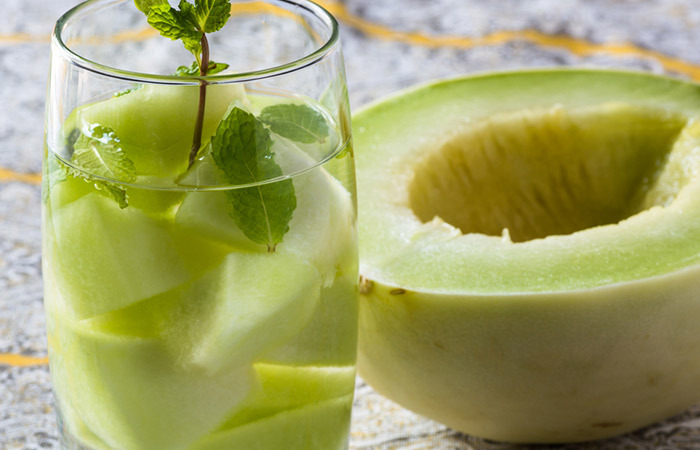 Honeydew melons are rich in vitamins A, B, and C, antioxidants, and potassium that help to reduce the risk of diabetes, heart disease, and cancer (33). 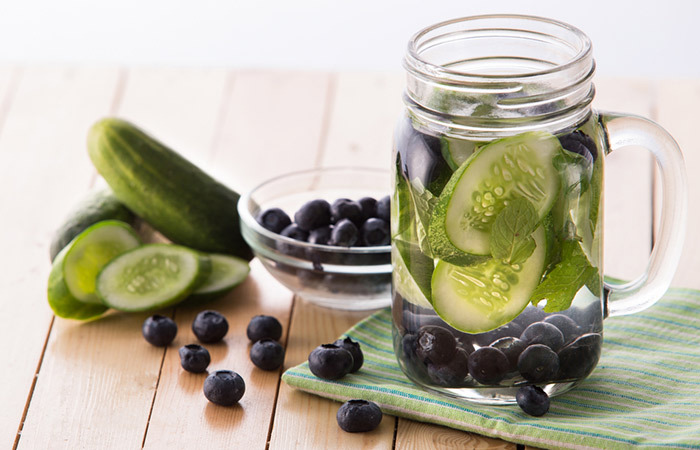 Add the halved blueberries and cucumber slices to a 1-liter jar of water. Let it steep for 5 minutes and then drink it. Blueberries are rich in antioxidants and have anti-inflammatory properties that help to reduce skin rashes, swelling, and also aid weight loss (34). Cucumbers are low in calories, high in water content, and can help lower cholesterol, reduce skin rashes, and flush out toxins (35). 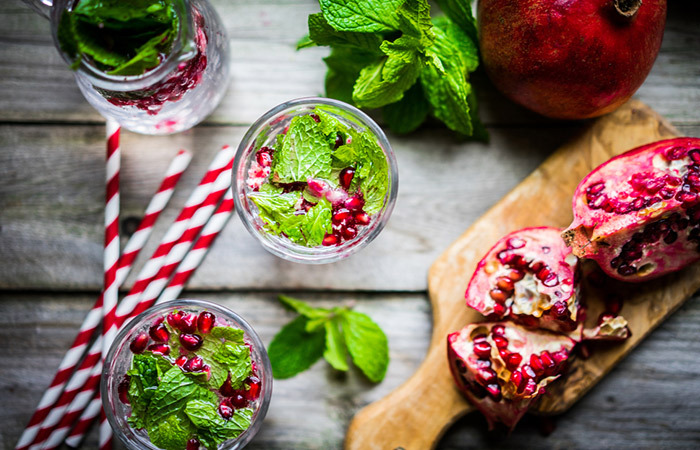 Toss the pomegranate and a handful of mint leaves into a jar or bottle containing one liter of water. Let it steep for two hours in the refrigerator. Pomegranate helps to regulate blood pressure and has anti-inflammatory, antioxidant, and anticancer properties (36). Mint leaves have a cooling effect. They aid proper digestion and have anti-tumor, antioxidant, and antimicrobial properties (37). Deseed the raspberries and cut them in half. 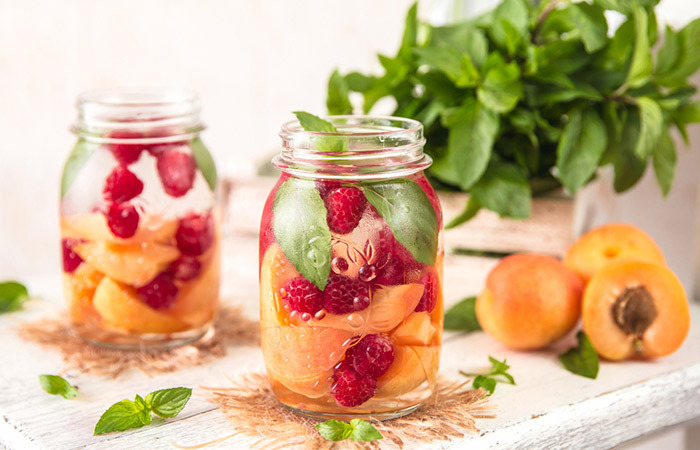 Add the sliced apricots and halved raspberries to a jar containing one liter of water. Apricots are a great source of vitamin C, and they help protect the heart and prevent tumor formation (38). Raspberries are rich in antioxidants that help scavenge the harmful oxygen radicals and fight cancer by inhibiting cancer cell proliferation (39). Add the cumin seeds to a jar containing one liter of water and let it steep overnight. In the morning, add the muskmelon cubes and a handful of mint leaves. Muskmelons are loaded with antioxidants that help to nullify the harmful oxygen radicals, support eye health, and prevent cancer cell proliferation (40). Cumin seeds support digestion, protect from cold and cough, and stimulate the menstrual cycle (41). Mint leaves have a cooling effect. They aid proper digestion and have anti-tumor, antioxidant, and antimicrobial properties (42). Toss the apple and lime slices into a jar containing one liter of water. Let it steep for one hour in the refrigerator. Apples are rich in phytonutrients that help to fight cancer, cardiovascular disease, asthma, and lower bad cholesterol levels (43). Limes are a great source of vitamin C and can be very helpful in relieving arthritis, stimulating digestion, preventing hair fall, and fighting cold and cough (44). 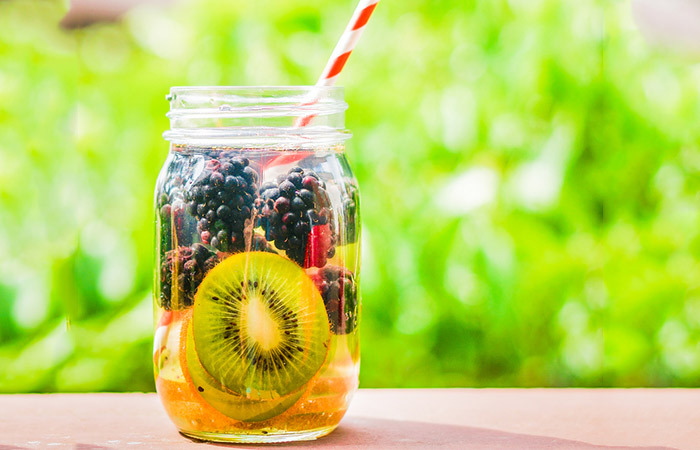 Toss the kiwi slices and blackberries into a jar containing one liter of water. 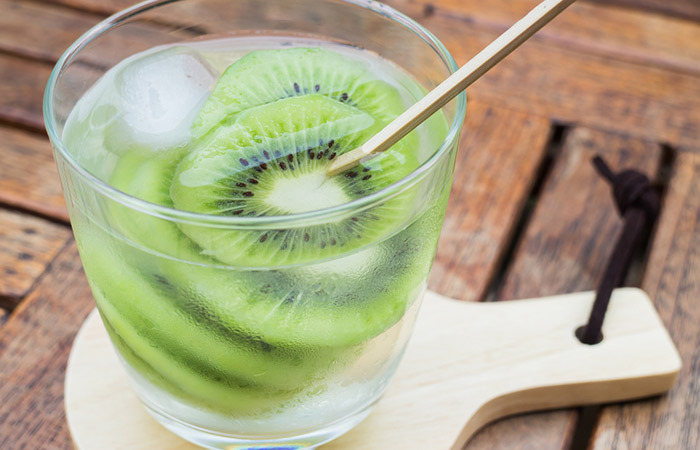 Kiwis help to decrease platelet aggregation and triglyceride levels and increase good cholesterol (HDL cholesterol) levels (45). Blackberries help to fight cancer, prevent diarrhea and dysentery, protect from anemia and mouth ulcers, and also have anti-inflammatory properties (46). 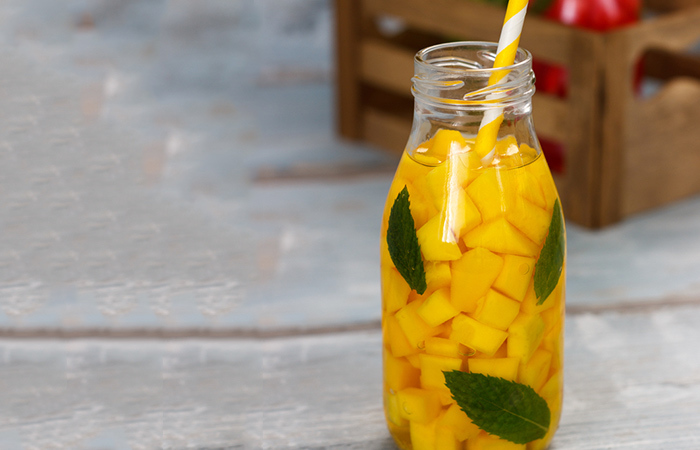 Add the mango slices and basil leaves to a jar or bottle containing one liter of water. Mangoes aid proper digestion, strengthen metabolism, regulate blood pressure, lower bad cholesterol, and improve insulin sensitivity (47). Basil leaves are loaded with antioxidants and help to flush out toxins and inhibit cancer cell proliferation (48). 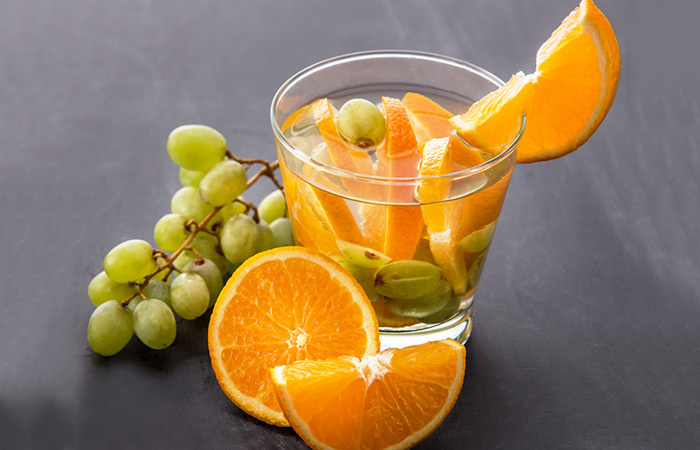 Add the orange slices and grape halves to a jar or bottle containing one liter of water. Let it steep for 30 minutes. Grapes help to inhibit cancer cell proliferation, lower cholesterol, and suppress platelet aggregation (49). Oranges are rich in antioxidants and vitamin C that prevent DNA damage and protect the heart (50). 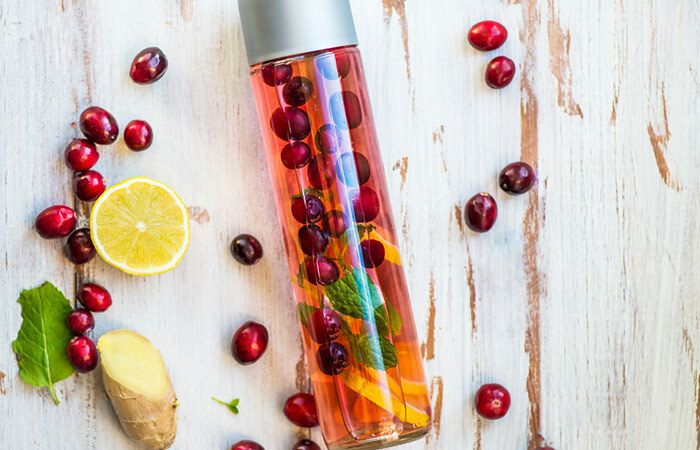 These infused water recipes are super easy to make, rich in nutrients, and help you fight different diseases and symptoms. 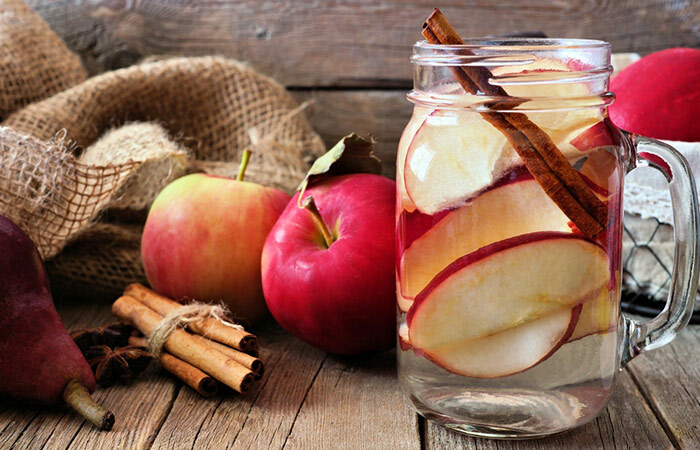 Try these recipes and make your water tastier and healthier. Stay hydrated, and you will see a reduction in your body weight and health problems and a tremendous increase in brain function. So, get started right away!